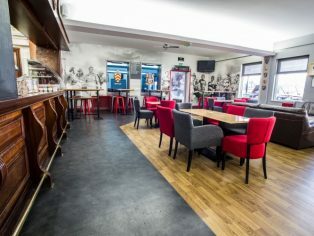 High design and hardwearing vinyl flooring from UK manufacturer Polyflor was used to create a brand new bar area for fans to socialise in at the home of Cardiff Blues rugby club, Cardiff Arms Park. 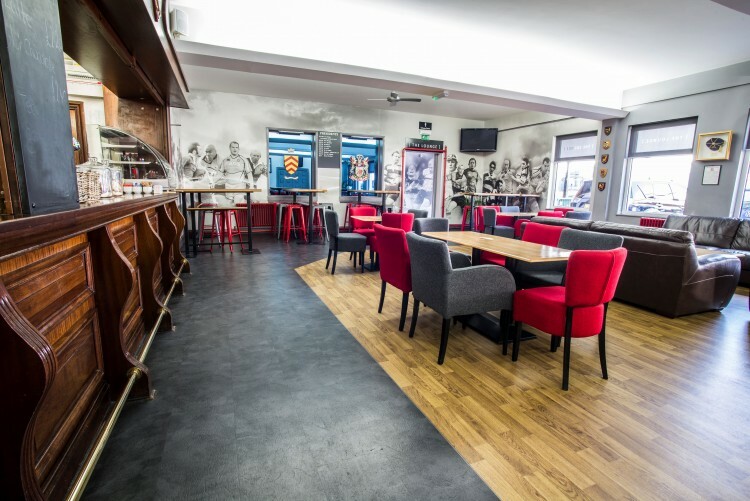 A mix of wood and stone effect designs from the Forest fx PUR sheet vinyl flooring collection and Expona Design PUR luxury vinyl tile range were both used in this updated cafe bar area at the stadium in the centre of Cardiff. The bar refurbishment was designed, managed and carried out by local interior fit out specialists Office Image, with the flooring installed by Gareth Wood Contract Flooring Services. Forest fx flooring in Rustic Oak and Expona Design tiles in Atlantic Slate were selected to complement the traditional bar area and rugby union themed decor in the suite. Atlantic Slate was used throughout the bar’s bathroom areas whilst Expona Commercial luxury vinyl tiles in in Blue Recycled Wood were also fitted to hospitality boxes overlooking the pitch. The Forest fx sheet vinyl range is available in 14 authentic wood effect designs, whilst the Expona Design LVT collection includes 28 options in wood, stone and abstract effects. Both ranges are suitable for heavy commercial environments in the leisure sector such as busy bar areas where a high level of footfall is expected. These vinyl floor coverings are further enhanced with PUR, Polyflor’s exclusive and robust polyurethane reinforcement which is cross linked and UV cured to provide superior cleaning benefits and improved appearance retention. Product samples can be ordered free of charge on the Polyflor website or by calling the Polyflor Samples Direct Hotline. Polyflor’s flooring contains recycled material and is 100 per cent recyclable via the Recofloor scheme.